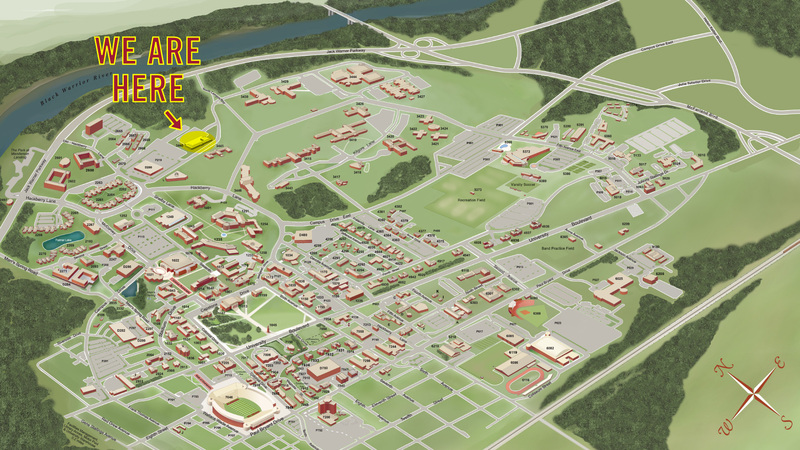 Click on the map for an enlarged version that includes new roads, buildings and traditional landmarks. Our friendly and expert Staff are ready to assist you with all of your printing related needs. Whether it is a postcard or a book, banner, sign, award, nametag, poster, newsletter or a 100,000 address multi-part mailed project, we can do it. From paper selection through design and production our team is here to serve your team. We are happy to show off our new facility and answer questions during regular business hours to groups from within the University and the community. Classes, organizations, departments, offices, clubs and other interested parties are welcome. A tour takes about an hour; we do modify to accommodate MWF classes. Group size up to 15. We can split into two simultaneous tours for larger groups with advance scheduling. Please contact the Director or one of the Associate Directors through our Staff Directory to make arrangements.